AfrikaBurn was brought into existence in 2006 and 2007 entirely by volunteers and donations and services provided for free (or nearly for free). It continued this way for many years, but as the event grew, so did the operational requirements – and expenses. One of the biggest changes was to offer a modest stipend to the go-to people behind key functions for the event and project. This was a highly-debated issue when changes were made in 2012. The growth of AfrikaBurn astounded everyone from the beginning. It started life as a runaway juggernaut and this trend shows no signs of slowing down. Very simply, though, the growth of the event outpaced the growth of the organisation that runs it. The increased workload brought many dedicated volunteers perilously close to breaking point. You may not know it, but this was one of the reasons behind limiting the numbers of tickets available to AfrikaBurn in previous years – the limited capacity of the team. In short, the number of people doing the year-round work needed to catch up to the work itself. We’ve made a big effort to bring more volunteers into the organisation, doing the important work of diversifying, and there are now clearly defined functions and tasks – and people in place to do them – to share the knowledge and spread the load. 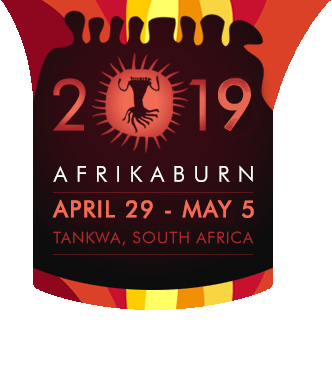 The aim is to make the event and organisation sustainable, and enable AfrikaBurn to grow as more than just an event. As part of this process, it’s really important to sustain the lives of those who dedicate themselves to this work. Paying people is an investment in the human beings that are the backbone of the organisation, and represents a modest recognition and recompense for their hard work, loyalty, and long-standing commitment to AfrikaBurn, its future, and what it can do in the world. Wherever possible, we continue to search for volunteer service providers, both inside and outside the organisation. But as in any operation, there are certain services for which it is necessary to pay. So, what do we mean by necessary in this regard? Well – to us – this means when someone who is critical to making AfrikaBurn happen doesn’t have an alternative income and is giving all (or most) of their time to working on the event and needs money to survive and make a living. Or they do have a separate income, but the demands of their volunteer role is such that they must work significant additional hours in order to fulfill it. And, what do we mean by modest? In our minds this is an amount of money that would be regarded as a fair and completely reasonable payment for their time contributed. While we are not there yet, the intention is ultimately to be able to offer an amount of money which is reasonably in line with what other managers of small non-profit organisations would get paid. In other words, it’s not a lot of money, it’s in fact below the standard rates that an equal position would be paid in a comparable industry, but it makes a real difference to the recipient and means our organisation’s core team are able to fully dedicate their time and energy to getting the job done. For more information, please take a look at our annual financial reports. Home About Governance & Transparency Are the Organisers Paid?